The first two Galileo in-orbit validation (IOV) satellites in space have achieved a new milestone, transmitting dummy signals in a modulation scheme designed to allow full interoperability with GPS once operational services start. 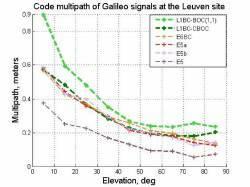 The European version of the common civil signal is the composite binary offset carrier (CBOC) modulation, which is being transmitted on the E1 Open Service signal. The CBOC modulation is the result of multiplexing a wideband signal, BOC(6,1), with a narrow band signal, BOC(1,1), in such a way that 1/11 of the power is allocated, on average, to the high-frequency component. Dummy/spare navigation messages will be broadcast for the time being by default on all open signals. The dummy/spare message contents are described in the public Galileo Open Service Signal In Space Interface Control Document. The Galileo satellites are now entering into a phase of routine operations with continuous signal transmission on E1, E5, and E6 signals. Time of week (TOW) and week number fields of the broadcast navigation messages will be synchronized with Galileo System Time. The first two Galileo IOV satellites were launched from Europe’s Spaceport in Kourou, French Guiana, on October 21, 2011, and since then have been progressively put through a series of tests. These spacecraft are serving to validate the Galileo system design as well as serve as fully functional elements of the eventual 30-satellite constellation planned to follow. Four satellites, the minimum number needed to achieve a position fix at user level, will become available later on this year. This autumn, the next two satellites will be launched together from French Guiana. Once they are commissioned, Galileo will have its operational nucleus complete, able to perform actual ranging when all four satellites are visible from a receiver. Users intending to perform experiments might experience variations with respect to the current navigation message contents due to the in-orbit validation activities being performed.